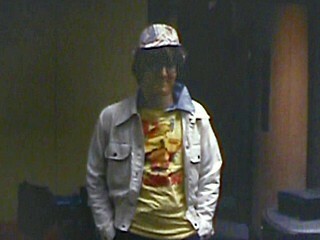 This is part of a series of articles based on images from my 1970s home movies. For more details, click here. It was March of 1975. 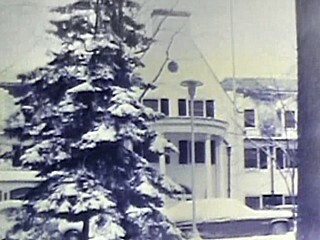 I was finishing my first year as the program director at Cable T V-3 in Washington, Pennsylvania. High school wrestling was very popular there. Fans flocked not only to the local school-vs-school matches  our cable channel televised one of these each week  but even to the PIAA state tournament for individual wrestlers that was held each spring. The local radio station, WJPA-AM, broadcast the two-day state tournament in its entirety. Pete Stanton had been handling the announcing since 1950. He called the action live all day and night. 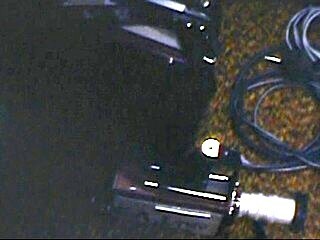 According to Chuck Finders 2000 Pittsburgh Post-Gazette article, Pete was equipped with a hand-held microphone and a three-inch stack of commercials to read. He described, as best he could, 192 matches in Fridays first round and all the matches that followed. TV-3 also found it profitable to broadcast the state tourney. We spent about $1,000 to do so and earned about $2,000 in advertising revenue. However, we couldnt telecast it live; that would have been prohibitively expensive. We recorded the action on videocassettes. When the weekend was over, we drove back to Washington with the tapes, to be aired on Monday and Tuesday nights. Because we werent live, we could be selective. We taped only the wrestlers from our general coverage area (basically Washington and Greene counties), followed by the complete championship round for the larger schools. Even with that restraint, our playbacks ran for about four hours on Monday night and four more on Tuesday. 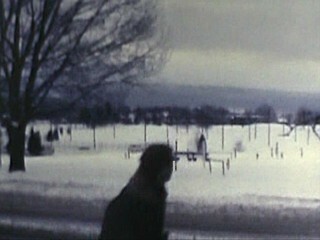 I took along my movie camera to record the behind-the-scenes images you see below. 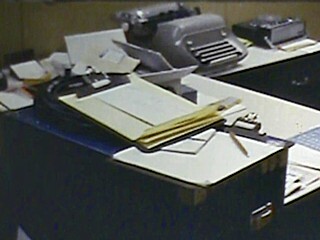 On Thursday evening, March 13, 1975, after our regular TV-3 programming signed off at 8:00 PM, we grabbed a quick nap, then reconvened after midnight to disconnect the studio equipment that we would need for our remote operation. We stacked everything in the TV-3 lobby so we could check that we weren't forgetting everything. 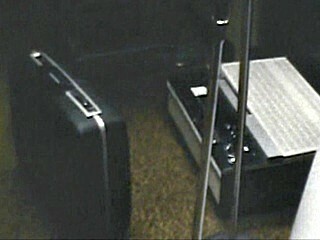 Thats my suitcase next to a couple of microphone stands and one of our ¾-inch U-Matic videocassette recorders. And thats our Rover hand-held camera and recorder, with which we planned to record interviews and other activities away from the wrestling mats. 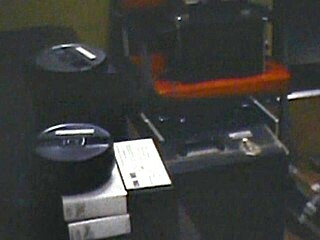 We had to take plenty of blank tape stock, ½ reels for the Rover and boxed one-hour cassettes for the U-Matics. Stacked on my desk were commercial schedules, billboard copy, and clipboards for noting down times. 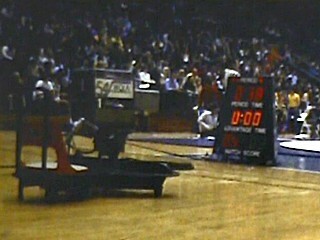 I had once attended the Ohio state high school tournament, at St. John Arena on the campus of Ohio State. But 1975 would mark my first trip to the Pennsylvania championships. 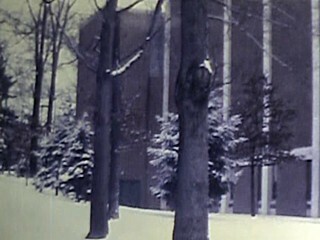 They were being held at Penn State Universitys Rec Hall, the home of Nittany Lion basketball and other sports. 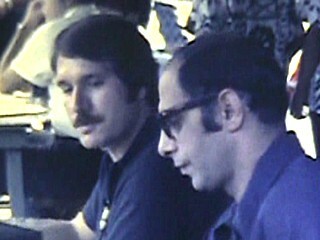 I would be traveling to State College with our camera operator Tim Verderber and our sportscaster Larry Schwingel, who had been there the year before for TV-3s inaugural coverage of the event. Our analyst, traveling separately, would be Trinity High Schools Paul Abraham. 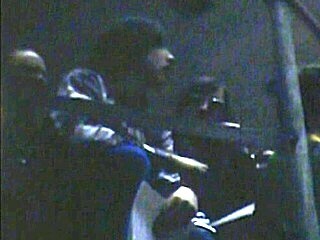 He had arranged for Tim and Larry and me to use of one of his schools rooms at the hotel next to the arena. Larry (on the left) and Paul (on the right) had been the announcers for our Bronco League World Series coverage the previous August. Tim was in charge of loading the gear into the van that served as TV-3's mobile unit, with help from Larry and me. We three left at 2:00 AM. 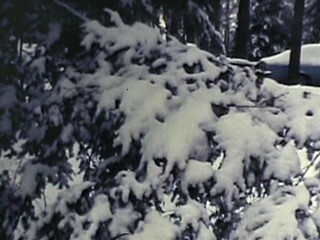 However, our planning had not allowed for a mid-March snowstorm. 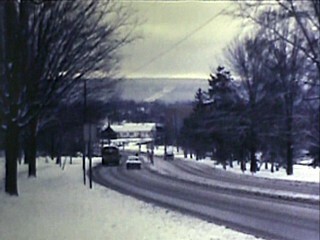 It took us seven hours to drive the 170 miles, particularly difficult on two-lane roads. Many of the four-lane highways of today were still years in the future. As we made our way into town, traffic was at a standstill on Atherton Street. One of our crew (not this guy) needed a restroom, so he got out of the van, walked to a gas station, and walked back to the van before we had gone a hundred yards. 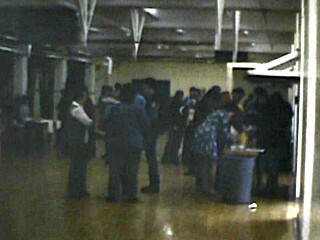 and the nearby Recreation Hall, where the tournament was already getting under way. 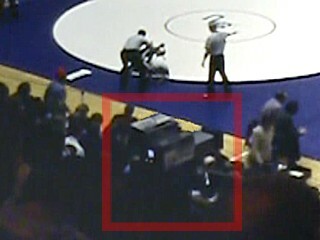 Fortunately, the first wrestler from a high school in our coverage area would not be competing until 9:55. We parked the van in the small parking lot adjacent to Rec Hall. In the right foreground is a larger truck from WQLN channel 54, the public TV station in Erie. We entered through this ground-level area under the east stands and carried our equipment up to the top of the arena. 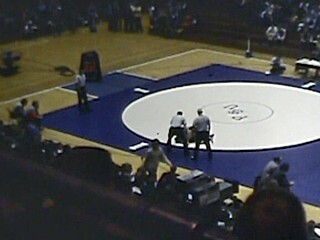 Two wrestling mats had been set up on Penn States basketball court, and boys were competing on each. Our assigned position was near the red X in the photo below, on the balcony, a running track that circled the building just below the roof. 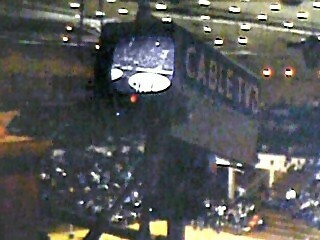 We quickly set up our single black-and-white camera to tape the first match of local interest. Next, to be played back before that match, Larry recorded a welcome to State College intro segment. Then we had a little time to catch our breath and meet some of our neighbors along the balconys press row. We would return to the state finals in each of the next five years, first at Rec Hall and later at Hersheypark Arena. For most of these years, I believe the public TV broadcaster was no longer WQLN but now WLVT-TV from Allentown and Bethlehem. 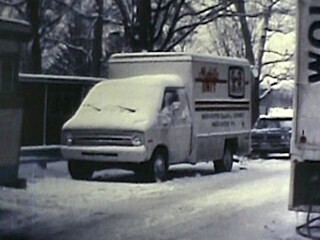 These photos are from Jim Boston and George Hoovers book TV on Wheels. 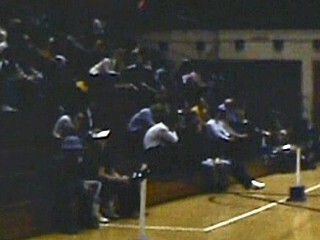 WLVT regularly televised college wrestling in eastern Pennsylvanias Lehigh Valley. At our high school event at Penn State, they taped all 12 championship matches on Saturday night. We arranged to take a feed of their video during that championship round. 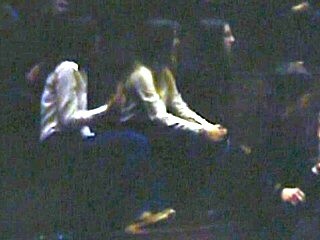 We still recorded our announcers audio, but the public TV pictures were from better angles and in color. 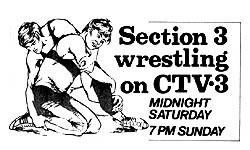 Channel 39s usual wrestling announcers were Sheldon Siegel and Marvin Wilenzik. At one of those later tournaments, I was keeping track of the team standings, and when one of the schools clinched the title I returned the color-video favor by relaying the news to WLVT analyst Larry Sheridan. Shel, the lead announcer, was actually the president of the station. He had managed it since its founding ten years before, and he would hold that post until 1994, when he retired after admitting he had authorized staffers to phone in fake bids to raise the ante during the stations on-air fund-raising auction. 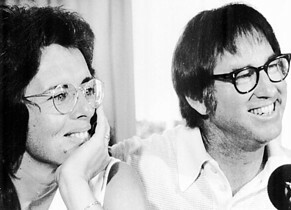 I dont recall the name of the reporter from Jersey Shore, but he resembled a bespectacled over-the-hill tennis player who, in the Astrodome a year and a half before, had lost a much-hyped Battle of the Sexes match to Billie Jean King (left). So we called him Bobby Riggs. One of our neighbors was not very neighborly. We dont know who did it, but between Friday night and Saturday morning somebody absconded with part of our equipment, namely the Rover handheld camera and portable recorder. We never saw that Rover again. Insurance money eventually bought us a replacement. On the balcony, the angle for our tripod-mounted TV camera was higher and farther away than it had been during the regular-season wrestling matches we had cablecast from high school gyms. 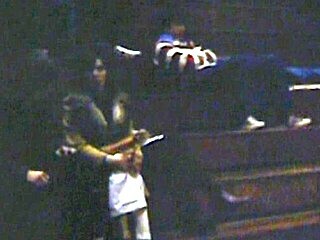 But we could zoom in to get a tighter shot. The public TV station had staked out closer positions for its cameras. 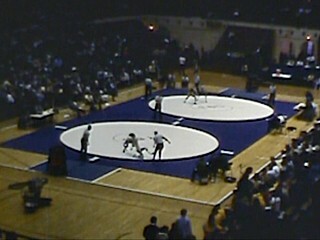 One was positioned in the lower stands between the two mats. From there they could get a closer look at the holds than we could. On the other hand, our telecast, not needing to show wrestlers from the eastern end of the state, had the advantage of focusing on kids with whom our viewers were familiar. Ideally, especially when a pin is about to happen, youd like to have a camera at an even lower angle to share the referees look at the narrowing gap between a wrestlers shoulders and the mat. Therefore, channel 54 had a special dolly that allowed a cameraman to practically sit on the floor. 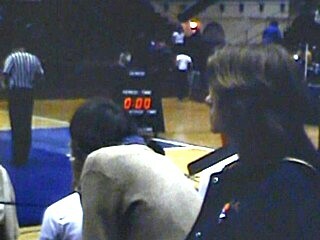 Because more than one match was taking place at the same time, Rec Halls usual scoreboard wasnt sufficient. 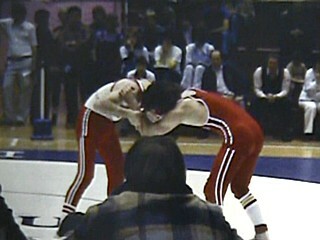 Instead, each mat was flanked by a truncated pyramid that showed the period, time, advantage time, and points for each wrestler (one wearing a red ankle band, the other green). Up on the balcony, my job was to start and stop the videocassette recorder and log the times. In later years, I also did some of the announcing, mostly in a host role. I read the sponsors billboards and introduced the next match. Then, being no expert on wrestling holds, I turned the microphone over to the others to describe the action. I was proud of myself for knowing enough to anticipate the refs rather obvious call. Friday was finally over. It had been a very long day, including packing and a seven-hour drive and about eleven hours of wrestling, four of which we had taped. So when evening arrived, we gladly turned off our equipment and adjourned to the nearby inn. We checked in to our tiny room (two double beds for three people), then headed to the spacious dining room, which was overflowing with wrestling folks. We had to wait at least an hour for a table. I slumped in a chair in the lobby, hungry and exhausted. Tomorrow would be another day, with more wrestling action cheered on by more fans. One nervous supporter couldn't bear to be close to the action. She got as far away as she could, standing on the running track high above the end zone. In the sequence of four dim but enhanced frames above, she screamed out to her wrestler, wilted with disappointment, and turned away. Our coverage concluded on Saturday night with the crowning of the state champions in each weight class. 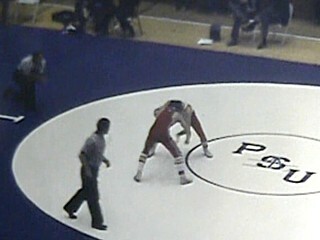 Now only one mat was in use, for one match at a time. On Sunday, we would drive home. 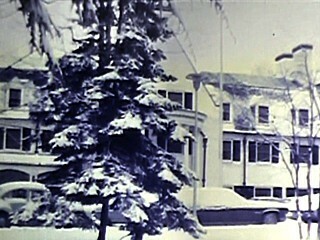 The tapes were shown to our cable TV subscribers over the following two nights. Another milestone in sports television!